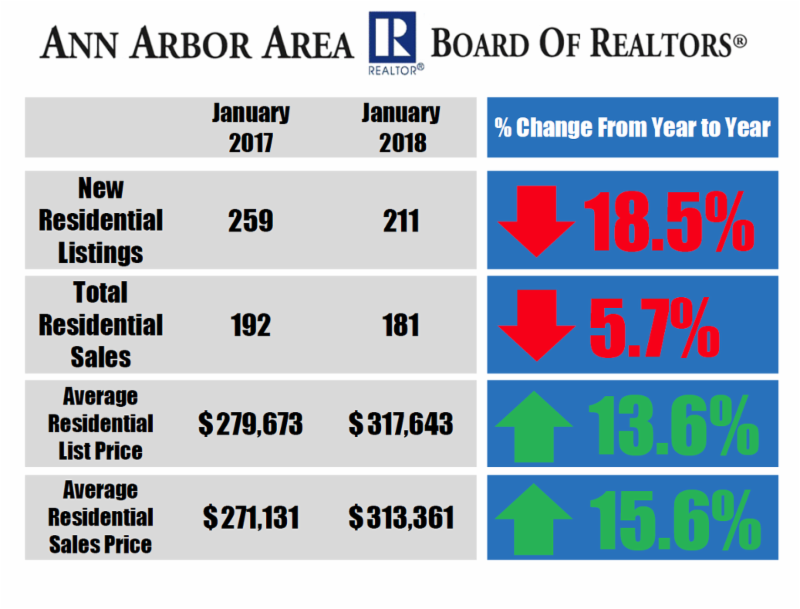 Average listing and sales prices for single family homes have risen significantly compared to a year ago, according to data released by the Ann Arbor Area Board of REALTORS®. The average residential listing price in January 2018 jumped 13.6% to $317,646, compared to $279,673 in January 2017. Average residential sales prices for January 2018 are up a staggering 15.6% at $313,361, compared to $271,131 in January 2017. Inventory continues to dip, as the number of new single-family listings dropped to 211 in January 2018 from 259 in January 2017, a difference of 18.5%. Total residential sales also dipped 5.7% from January 2017. Unsurprisingly, 22% of residential homes sold above list price in January 2018, likely due to sparse inventory. Lawrence Yun, NAR chief economist, says pending sales edged up in December and reached their highest level since last March (111.3). "Another month of modest increases in contract activity is evidence that the housing market has a small trace of momentum at the start of 2018," says Yun. "Jobs are plentiful, wages are finally climbing and the prospect of higher mortgage rates are perhaps encouraging more aspiring buyers to begin their search now." Read the full report from NAR on pending home sales. To see more Ann Arbor Area housing statistics, view the January 2018 Housing Statistics Report.